VO5 is definitely the brand I have most products of. 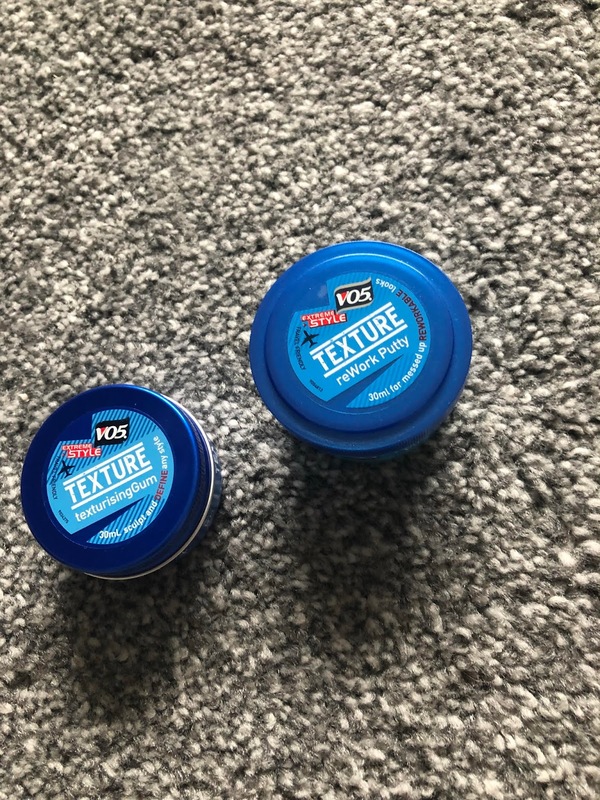 I have 2 back up tins of fluff tamer as this is one of my go to products due to how well it works. 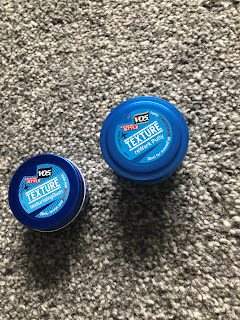 I also have their clay to give a go, along with a matt paste that has just been switched out of my rotation I haven't been finding this too bad. I then have a gel which came in a set at Christmas time a textured quiff spray I got a few days a go which I cant wait to try and finally a matt definition spray which also came in a gift set. 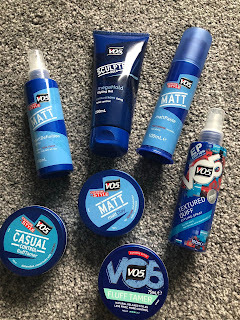 VO5 to me are a very good brand especially for the price range and it is so easy to buy as most supermarkets stock it. 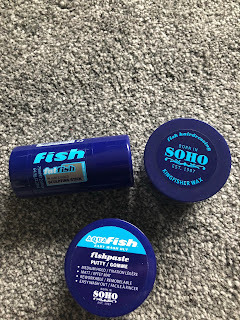 Fish are a brand I discovered through the blog as they got in touch for me to review a selection of their products. I quickly fell in love with them and I keep switching this wax and putty in and out of my rotation. I also picked up the wax stick from the pound shop and so far it is so good. 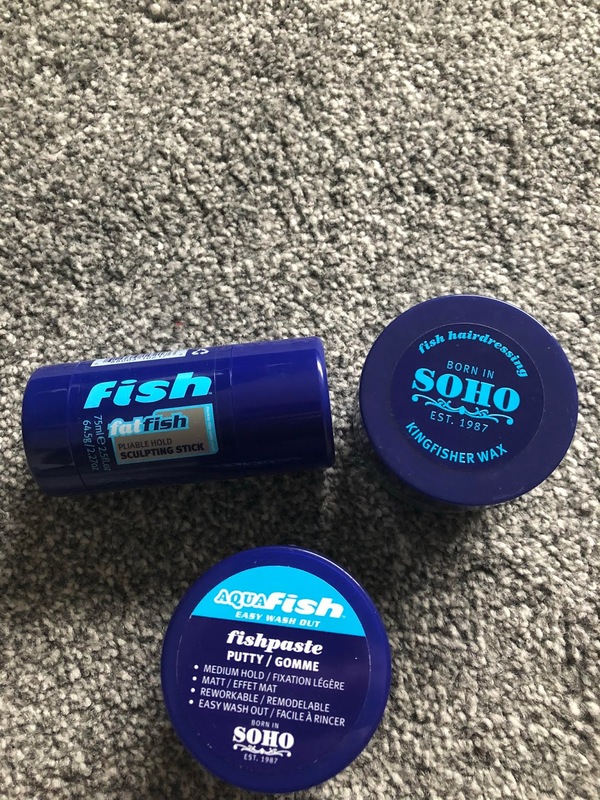 Fish are another reasonably priced brand which I need to test out more of their products. A brand I discovered the other year was Johnny's chop shop, I became obsessed with their hairspray which then lead me to trying out more of their items. 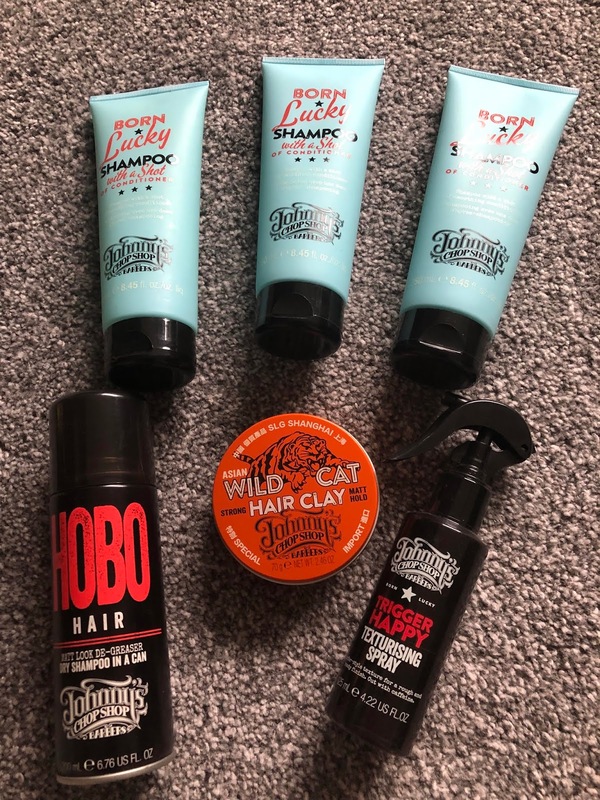 As you can see the only shampoo I used was the born lucky one for a while which the family picked up on and I ended up receiving 4 bottles at Christmas, I am well and truly stocked up. The hobo hair has been a lifesaver since I got it for those days I am just lounging around and not too bothered about doing my hair. 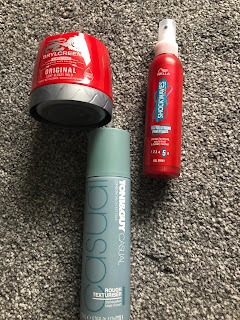 The texturising spray is another item I have loved for a while and keeps finding its way into the rotation every few months. The clay is something I am still to try seen as I only picked it up to make full use of the boots 3 for 2 offer. 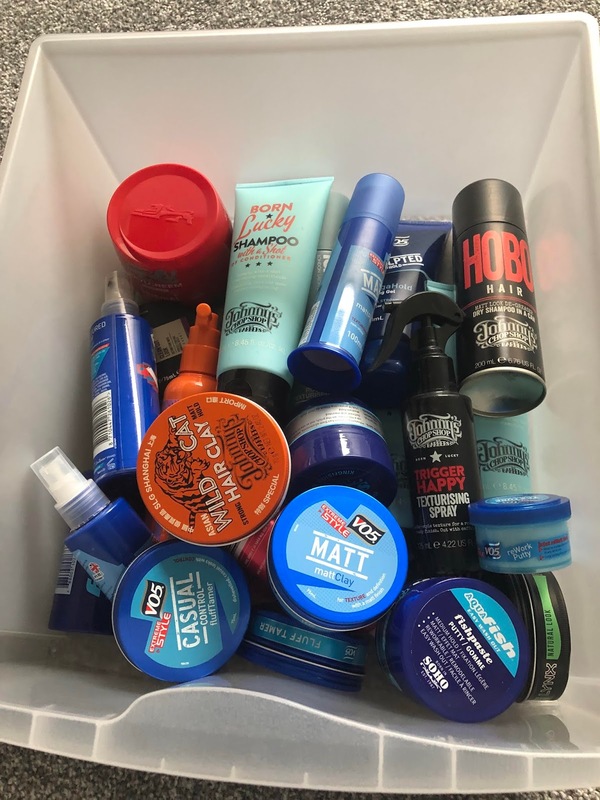 A few random ones here are the Brylcreem which seems to be ok for my hair but I really need to try use it a little more as I have a lot I need to get through. The Shockwaves gel spray is another one I picked up just because it was cheap, I haven't opened this yet but I will be sure to give it a try soon. 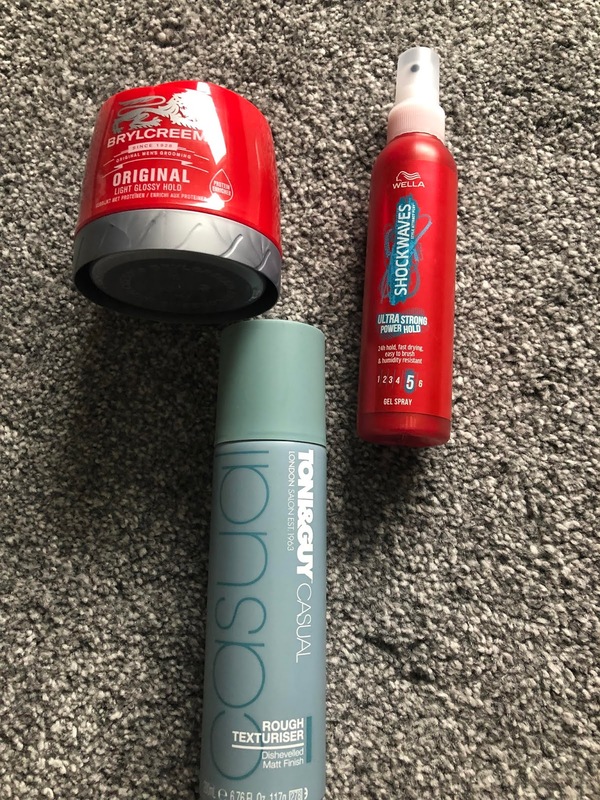 Then I have this Toni & Guy rough texturiser which I actually got from my mum, she didn't want it anymore so I said I would take it off her hands and see what I thought of it. I have mentioned the Lynx hair collection on here a few times in the past and I love them. I need to finish off these tins then I think I may hold off buying them as I need to get through so many others but when I have these in reach I just go straight for them at their low price though they are handy to keep stocked up on. Fudge are a brand I will go mad with or just go for ages without buying anything. Currently I have this raspberry styling mousse that isn't too bad but I don't tend to use very often. I also have the blow dry creme which is to help create a messy look. It actually does work when I blow dry my hair but with my hair so short I don't usually dry it. 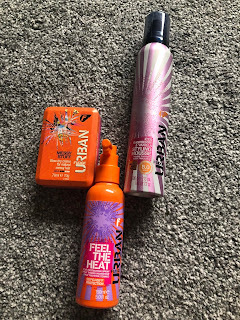 This is also the same case with the heat defence spray it isn't often I use heat on my hair these days but when I do this really helps. Finally we have just a couple of miniatures which I keep around just in case I have a small trip away. It isn't often I am away from home for a while but if I have somewhere to be I will just through these in my bag. Also these are perfect for if I was to head out straight from work and my hair needed a little touch up. So there you have it those are the products I really need to start working through instead of going out and buying new items. 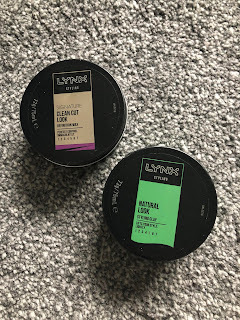 Would you like to see me do a brand focus on any hair items? Let me know in the comments below.